Of all indoor series events, the Gambler’s Classic continues to be the most coveted. It’s been won by some of the biggest names in racing. The late Ted Christopher, Erick Rudolph, Lou Cicconi and others have all etched their names into the record books as winners. Andy Jankowiak has been good enough to be in that company, but he just couldn’t break through. He’s been so close on several occasions to achieving the ultimate triumph inside Atlantic City’s Boardwalk Hall in the Gambler’s Classic TQ Midget event. The pavement Modified standout has finished in the runner-up position, won multiple preliminary night features as well as winning mains at other venues. Atlantic City’s main-event has eluded him. That was until this past Saturday night. It was a dominating performance for Jankowiak after starting on the outside of the front row. He stayed right to the rear bumper of former winner and pole-sitter Anthony Sesely right from the start. He made his move with just six laps complete. Passing is always at premium in indoor racing, but Jankowiak was able to make short work of Sesely by crossing him over as he came off of turns one and two before making it stick in corners three and four. Jankowiak knew that he had to get to the lead as quickly as possible. Once in front it was his race to lose. 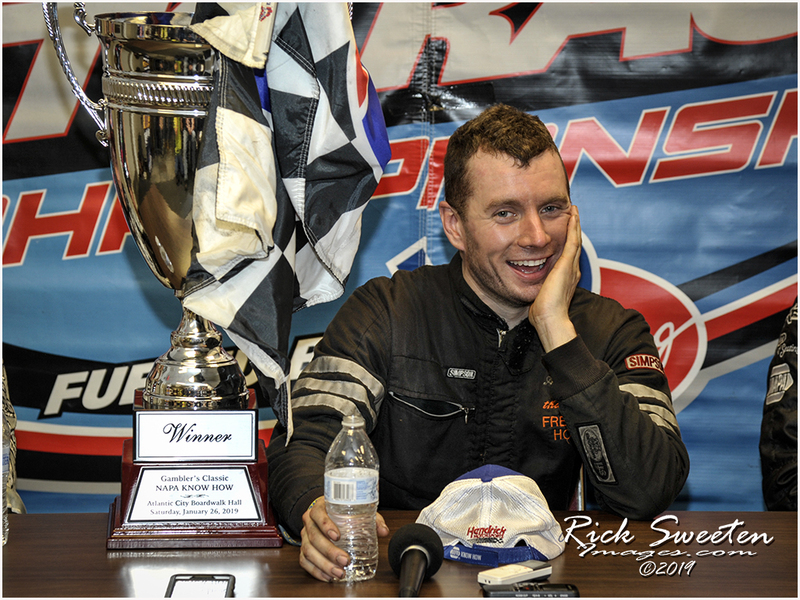 There are no guarantees with indoor racing as things can change in a hurry and often do. He was methodical as the race went on as he was chased by defending race winner Ryan Flores. Flores could hang with Jankowiak and he got close once only to bobble allowing Tim Buckwalter to sneak by. Buckwalter was unable to gain ground. The win came in a car what was built by Jankowiak along with car owner Ricky Kluth with an engine built by Sparky Grape. It was motor that Jankowiak had to drive to Texas in order to get repaired after damaging the powerplant in Allentown. All of that together helped propel Jankowiak to the checkered. Good enough indeed to call himself a Gambler’s Classic winner.